The deposition of unconjugated bilirubin (UCB) in selected regions of the brain results in irreversible neuronal damage, or Bilirubin Encephalopathy (BE). Although UCB impairs a large number of cellular functions in other tissues, the basic mechanisms of neurotoxicity have not yet been fully clarified. While cells can accumulate UCB by passive diffusion, cell protection may involve multiple mechanisms including the extrusion of the pigment as well as pro-survival homeostatic responses that are still unknown. Transcriptome changes induced by UCB exposure in SH-SY5Y neuroblastoma cell line were examined by high density oligonucleotide microarrays. Two-hundred and thirty genes were induced after 24 hours. A Gene Ontology (GO) analysis showed that at least 50 genes were directly involved in the endoplasmic reticulum (ER) stress response. Validation of selected ER stress genes is shown by quantitative RT-PCR. Analysis of XBP1 splicing and DDIT3/CHOP subcellular localization is presented. These results show for the first time that UCB exposure induces ER stress response as major intracellular homeostasis in surviving neuroblastoma cells in vitro. The toxic effects of bilirubin, a bile pigment produced during the catabolism of heme-containing compounds , have been documented in various biological systems. Nearly all newborn infants develop increased levels of unconjugated bilirubin (UCB) in the blood stream, clinically evident as neonatal jaundice . Although this is a benign and transient phenomenon, abnormal accumulation of bilirubin may cause bilirubin encephalopathy ranging from minimal neurological injury to severe and permanent condition leading to neurodevelopmental dysfunctions . Furthermore, infants affected by the genetic pathology of Crigler-Najjar I present high UCB plasma levels and are particularly exposed to bilirubin encephalopathy (BE) . The basic mechanisms of hyperbilirubinemia neurotoxicity have not been fully clarified, although it has been shown that UCB may impair a large number of cellular functions, including energy metabolism , cell proliferation , DNA and protein synthesis , receptor functionality , and neurotransmitter uptake and release . Furthermore, in the brain UCB seems more injurious to neurons than to glial cells, with effects that depend on the cellular subtype . The endoplasmic reticulum (ER) plays a crucial role in the synthesis and folding of newly secretory and membrane proteins . Any perturbation that compromises protein folding and functionality of the ER is referred to as ER stress. The ER stress response can promote cellular repair and survival by reducing the load of unfolded proteins through global attenuation of protein synthesis and by upregulating chaperones . This response is collectively termed as the unfolded protein response (UPR) and is mediated by three ER transmembrane receptors: pancreatic ER kinase PERK (also known as eukaryotic translation initiation factor 2α (eIF2α) kinase 3 (EIF2AK3)), inositol-requiring enzyme 1 (IRE1) and activating transcription factor 6 (ATF6). In resting cells, all of these ER stress receptors are maintained in an active state through their association with the ER chaperone GRP78 (also called BiP). An accumulation of unfolded proteins causes dissociation of GRP78 from PERK, IRE1 and ATF6, thereby initiating the UPR. Thus UPR is a pro-survival response to reduce the accumulation of unfolded proteins and restore normal function . However, when misfolded-protein aggregation persists and ER stress cannot be resolved, signalling switches from a pro-survival to a pro-apoptotic pathway. Recently, the ER has attracted attention as a key subcellular compartment in which the effects of several cellular stresses may contribute to pathological processes culminating in neuronal injury and degeneration. A central role of ER dysfunction is evident in various pathologies of the brain, including acute injuries (transient ischemia, trauma) and neurodegenerative disorders (Alzheimer's, Parkinson's and Huntington's diseases) . The present study was designed to analyze the consequences of bilirubin exposure to better understand the molecular processes underlying neuronal damage and homeostasis. We used high density oligonucleotide microarrays to analyze the gene expression profile of human neuroblastoma SH-SY5Y cells upon UCB treatment. Gene expression data and experimental validation point to ER stress as the major intracellular homeostatic response in surviving cells. The human neuroblastoma SH-SY5Y cell line is a well-established in vitro cellular model to study the biological consequences of neuroactive molecules, drugs and toxins. To assess UCB effects, we have taken advantage of previous studies where the outcome of clinically relevant UCB concentrations was tested and the cytotoxic effects revealed [15, 16]. The sensitivity of SH-SY5Y cells to UCB treatment was thus evaluated by measuring cell viability after exposing cells to a concentration of free bilirubin of 140 nM (Bf 140 nM) for 1, 4 and 24 h. As shown in Figure 1, cell viability was reduced to 60% already after 1 h of UCB treatment and the extent of reduction in cell viability never exceeded the 40% of the cell population, even with longer treatments. Cell viability in SH-SY5Y cells treated with UCB. SHSY5Y were exposed to UCB treatment at Bf 140 nM during a time course of 1, 4 and 24 hours and cell viability was evaluated by MTT assay. Cell viability of UCB-treated samples was expressed as a percentage of the respective samples treated with DMSO 0.6%. Data are expressed as the mean ± SD of 3 independent experiments performed in triplicate. To examine the molecular events associated with the homeostatic response to UCB treatment, high density oligonucleotide microarrays (Affymetrix GeneChip Human U133A 2.0) were used to interrogate the expression of over 14,500 transcripts. RNA was isolated from SH-SY5Y neuroblastoma cells treated with Bf 140 nM for 1, 4 and 24 h. Experiments were performed in three biological replicates with control samples monitoring the effects of DMSO used as Bf solvent. Analysis of the microarray hybridization data, as reported in Methods, produced a list of 258 probe sets with a false discovery rate (FDR) of 10%. This list corresponded to 230 genes upregulated after 24 h of UCB treatment ("late response"). No down-regulated genes were detected. The fold change of transcript levels ranged from 1.2 to 6.9, the majority of which being toward the lower end. A list of all differentially expressed genes is provided in the Additional file 1. No significant changes of gene expression were observed after 1 and 4 h of UCB treatment ("early response"). We obtained a list of 58 probe sets when a FDR of 0% was applied and a list of 196 probe sets with a FDR of 5%. Furthermore, 400 probe sets were induced with a FDR of 20% with no down-regulated genes (data not shown). Differentially expressed genes were then examined for their Gene Ontology (GO) annotations concerning their cellular localization. As shown in Table 1 and as detailed in the Additional file 2, the analysis revealed that these genes were mainly distributed in the endoplasmic reticulum (ER), the Golgi apparatus (Golgi) and in the nucleus. To obtain insights into the pathways in which they were mainly involved, genes were sorted into distinct functional subgroups. UCB treatment induced genes belonging to functional categories related to the UPR in the protein secretory pathway (Table 2) as well as to regulation of transcription and DNA-dependent processes (Table 3). A set of up-regulated genes included plasma membrane transporters of the family of the solute carrier transporters (SLCs) and other genes involved in amino acid metabolism (Table 4). In the remaining part of the manuscript the attention will be focused on the UPR and ER stress responses, since the majority of up-regulated genes are well known members of these homeostatic pathways. Identification of the cellular localization of differentially expressed genes in response to 24 h of UCB treatment at Bf 140 nM in SH-SY5Y cells. The table shows the number and percentage (%) of the 217 total genes that were recognized as valid gene names in the gene_association.goa_human_hgnc file according to GO slim terms from the cellular ontology in regard to Endoplasmic reticulum, Golgi apparatus and nucleus localization. All details are reported in Table S2 in the Additional file 2. Differentially expressed genes involved in ER stress signalling and UPR in response to UCB treatment in SH-SY5Y cells. Genes are sub-categorized according to their GO Biological Process annotation. Fold changes (FC) are fold differences for cells treated with Bf 140 nM versus cells grown in DMSO 0.6% (controls) for 24 h. Affymetrix Probe Set-IDs, gene names and symbol, fold change (FC), and cellular location are indicated. Differential expression of genes mapping to "regulation of transcription, DNA-dependent" (GO Biological Process) in response to UCB treatment in SH-SY5Y cells. Fold changes (FC) are fold differences for cells treated with Bf 140 nM versus cells grown in DMSO 0.6% (controls) for 24 h. Affymetrix Probe Set-IDs, gene names and symbol, fold change (FC), and cellular location are indicated. Differential expression of genes involved in protein synthesis/translation, amino acid metabolism/transport and autophagy in response to UCB treatment in SH-SY5Y cells. Genes are sub-categorized according to their GO Biological Process annotation. Fold changes (FC) are fold differences for cells treated with Bf 140 nM versus cells grown in DMSO 0.6% (controls) for 24 h. Affymetrix Probe Set-IDs, gene names and symbol, fold change (FC), cellular location are indicated. UPR serves many aspects of the secretory pathway and is predominantly involved in the response to stress conditions when proteins are misfolded. GO categories of UPR components induced by UCB are shown in Table 2. These include stress sensing and signalling, protein folding, translocation, vesicular transport and ER-associated degradation. Genes known or predicted by sequence homology to play a physiological role in secretion or in the biogenesis of organelles were also increased. The largest group of up-regulated genes was represented by ER-resident molecular chaperone and oxido-reductase proteins. Among the molecular chaperones, we found established UPR target genes such as HSPA5 (heat shock 70 kDa protein 5) (upregulated 2.3 times), known also as GRP78 (glucose-regulated protein, 78 kDa) or BiP , HSP90B (heat shock protein 90 kDa beta (Grp94) (1.5), member 1), DNAJB9 (4.4) and DNAJC10 (1.8). Additional genes included PDIA5 (1.7), PDIA6 (1.5) and ERO1LB (2.1) that are involved in oxidative protein folding . A second major group was composed by genes involved in co-translational translocation of proteins across the ER membrane, to the Golgi and in the anterograde/retrograde transport back into the cytosol. The group included the signal sequence receptor SSR1 (1.6), the translocating chain-associating membrane protein TRAM1 (1.8), members of the SEC61 complex, such as SEC61A1 (1.6), SEC61A2 (1.4) and SEC63 (1.5), and SERP1 (Stress-associated Endoplasmic Reticulum Protein 1) (1.9), also known as RAMP4 (Ribosome-Associated Membrane Protein 4), that is a Sec61-associated polypeptide specifically induced by ER stress . Up-regulated genes were also represented by the coated vesicle membrane proteins, such as SEC23B (1.8), SEC24D (2.1), SEC31A (1.6) and SCFD1 (1.5), as well as by the transmembrane trafficking proteins TMED2 (1.4), TMED9 (1.6) and TMED10 (1.4). The ER-associated degradation (ERAD) system eliminates misfolded proteins by their retrotranslocation across the ER membrane into the cytosol, where ubiquitin-conjugating enzymes target them for proteosomal degradation. ERAD requires a number of dedicated ER-resident factors. Indeed, HERPUD1 or HERP (Homocysteine-induced ER Protein) (4.1)  was significantly induced as well as EDEM1 (ER Degradation Enhancer Mannosidase alpha-like 1) (2.1) , SEL1L (2.1), a transmembrane cofactor of the E3 ubiquitin ligase HRD1 , and DERL2 (Derlin membrane-like domain family member 2) (1.6) whose product associates with EDEM1 and is a specific target of the IRE1 branch of the UPR response . As shown in Table 3, several differentially expressed genes were classified into the GO category of "regulation of transcription, DNA-dependent". Up-regulated transcription factors included two established UPR target genes: DDIT3 (6.7), also known as CHOP or C/EBP homologous protein, and XBP1, X box-binding protein 1 (2.6). CHOP is a 29-kDa leucine zipper transcription factor that is ubiquitously expressed at a low level and robustly up-regulated in response to various stress conditions . CHOP is proapoptotic and a key mediator of ER stress-induced cell death [26, 27]. XBP1 gene, after a nonconventional splicing event , codes for a transcription activator that regulates a subset of ER-resident chaperones that are essential for protein folding, maturation and degradation in the ER . Additional stress-responsive transcriptional regulators induced by UCB included ATF3 (4.9), ATF4 (1.7), ATF5 (1.6), CEBPB (4.9), CEBPG (2.4), JUN (3.5) and JUND (1.6). Interestingly, although ATF4 showed a moderate induction, several of its downstream targets were strongly up-regulated, e.g. DDIT3, ATF3, CEBPB, CEBPG, CREB3L2 (1.7) and TRIB3 (6.7). TRIB3 (also known as NIPK, SKIP3, TRB3 and SINK) is an ER stress-inducible gene that is involved in CHOP-dependent cell death as a second messenger during ER stress . The translational machinery for a new boost of protein synthesis has been suggested to be amplified during UPR-associated translational attenuation [13, 31]. As shown in Table 4, we observed an up-regulation of 6 tRNA synthetase genes, such as AARS (1.7), CARS (1.8), GARS (1.8), MARS (1.5), SARS (2.2) and WARS (2.9), which are involved in tRNA processing. We also observed the induction of 2 eukaryotic translation initiation factors, that are EIF1 (1.4) and EIF5 (1.6). One of the stronger up-regulated genes was FAM129A (family with sequence similarity 129, member A) (6.9), also known as NIBAN, which has been recently demonstrated to be involved in the ER stress response and to positively affect the protein translation machinery by regulating the mTOR pathway . Interestingly, the list of genes induced during UCB treatment also includes DDIT4 (DNA-Damage-Inducible Transcript 4) (4.4), also known as REDD1/RTP801/Dig2, that is another well-known regulator of the mTOR pathway . The mTOR-dependent pathway is strongly connected to the autophagic machinery, and indeed autophagy-related genes such as GABARAPL1 (GABA(A) receptor-associated protein like 1 or ATG8) (1.9), GABARAPL3 (GABA(A) receptors-associated protein like 3 (pseudogene)) (2.3) and WIPI1 (WD repeat domain, phosphoinositide interacting 1 gene or Atg18) (2.8) were also positively differentially expressed, suggesting that surviving neuroblastoma cells may present an induction of autophagy [34, 35]. UCB exposure also activated genes involved in amino acid metabolism (Table 4). Among the strongest up-regulated genes, SLC7A11 (6.8) and SLC3A2 (3.8) were identified. These two genes encode respectively for xCT, the light chain subunit, and for 4F2hC, the glycosylated heavy-chain subunit, that are components of the system xCT, anionic amino acid transport system specific for cystine and glutamate . Recently, the UCB-induced SLC7A5 (3.2) has been shown to physically and functionally interact with SLC3A2, forming a bidirectional amino acid transporter and representing a key regulator of both the mTOR pathway and autophagy . For validation, we selected genes considered of interest based on their involvement in ER stress response. Gene expression levels of DDIT3, HSPA5, XBP1, HERPUD1, TRIB3, FAM129A and SLC7A11 were verified by qRT-PCR. Results are reported in Figure 2. The fold differences determined by qRT-PCR were very similar to those obtained by the high density oligonucleotide microarray gene expression analysis. Analysis of gene expression related to the ER stress response. Gene expression levels of selected genes (X axis) were analyzed by qRT-PCR. Y axis represents the gene expression level normalized to housekeeping genes (GAPDH and β-actin) of SH-SY5Y cells not treated (untreated) or treated with vehicle (DMSO 0.6%) or UCB (Bf 140 nM) for 24 hours. These results represent at least three RNA samples per experimental condition run in triplicate. 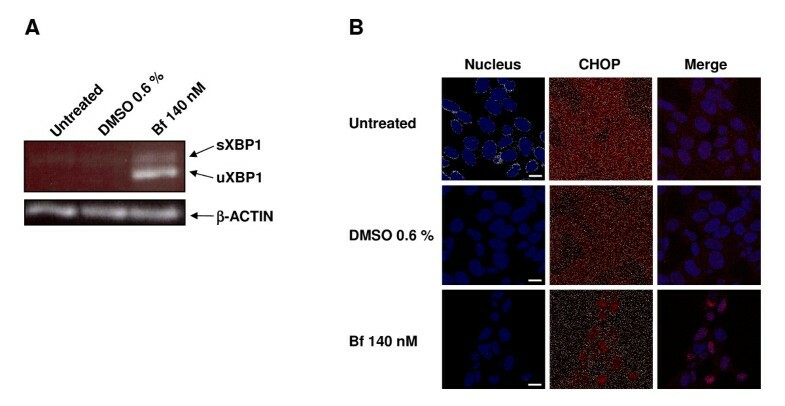 We investigated two independent events that are known activators of the ER stress transcriptional program: unconventional splicing of XBP1 and cytoplasm/nuclear shuttling of DDIT3/CHOP. The splicing of XBP1 transcript changes its open reading frame to code for a transcription factor (spliced XBP1 or sXBP1) that activates the expression of a subset of ER stress/UPR related genes [28, 29]. Here we show that UCB treatment is indeed able to trigger this unconventional splicing (Figure 3A). The nuclear localization of the transcription factor DDIT3/CHOP  is one of the most commonly used indicators of ER stress. As presented in Figure 3B, we observed a diffuse cytoplasmic localization in untreated and DMSO 0.6% control cells, but a major nuclear staining in cells treated with Bf 140 nM. This indicates activation of a CHOP-dependent transcriptional program. These data represent an independent proof of the induction of a vigorous ER stress. Analysis of XBP1 splicing and DDIT3/CHOP subcellular localization in SH-SY5Y cells treated with UCB. (A) mRNA levels of the spliced form of XBP1 (s - spliced, u - unspliced), indicator of ER stress, were examined by RT-PCR after 24 h of treatment. The amplified products were separated on a 2% agarose gel and visualized with ethidium bromide staining. Data are representative of n ≥ 2 separate experiments per condition point. (B) The expression of CHOP (shown in red) was examined with immunocytochemistry as described in Methods. Representative images are shown for SH-SY5Y cells not treated (untreated) or treated with vehicle (DMSO 0.6%) or UCB (Bf 140 nM). The nuclei (shown in blue) were visualized with DAPI staining. Bar = 10 μm. Bilirubin encephalopathy is one of the consequences of severe hyperbilirubinemia and is characterized by multifocal deposition of UCB in selected regions of the brain, resulting in temporary or permanent impairment of auditory, motor or mental functions . Cellular UCB level is closely related to the free concentration (Bf) of the pigment in plasma and to the mechanisms regulating the traffic of UCB among plasma, cerebral spinal fluid and cells. Although UCB is formed in virtually all cells and may enter by passive diffusion , intracellular concentration is determined by cellular export and metabolic transformation of the pigment. Interestingly, only certain neuronal cell types present a UCB susceptibility to undergo necrosis and apoptosis , whereas astrocytes are relatively spared. This has been linked to a higher content of MRP1, a transporter with high affinity to UCB  able to keep the intracellular UCB concentration low. Importantly, the level of MRP1 expression in human neuroblastoma SH-SY5Y cells is inversely and linearly correlated with UCB toxic effects . The molecular mechanisms of intracellular UCB toxicity are still unclear . UCB has been initially proved to be a pro-apoptotic agent, suppressing cell growth by inducing DNA fragmentation, mitochondrial release of cytochrome c, activation of caspase-3 and cleavage of poly(ADP)ribose polymerase . More recently, oxidative stress has emerged as a potential crucial event, since its generation mirrors UCB-mediated apoptosis [43, 44]. In various cellular systems, UCB causes reactive oxygen species (ROS) production, protein oxidation, lipid peroxidation and disruption of glutathione metabolism [43, 45–47]. Furthermore, UCB-mediated oxidative stress is also in part responsible for inhibition of cell growth [48, 49]. Inhibition of cell proliferation has been indeed observed in primary vascular smooth muscle cells in vitro as well as inferred by gene expression data on the repression of cell cycle-related genes in the liver of a mouse model of Crigler-Najjar type I disease . To study the effects of intracellular UCB on neurons, we took advantage of the human neuroblastoma SH-SY5Y cell line. These cells have been widely used in neurobiology as the in vitro system of choice to dissect molecular pathways leading to neurodegeneration. Previous studies have already shown that neuroblastoma cells are a good in vitro model to address the consequences of clinically relevant UCB concentrations . Although we are aware of the limitations in the use of a neuroblastoma cell line to recapitulate dysfunctions that occur in neonatal human brain, this experimental model allowed us to dissect in details the molecular events elicited by UCB. Treatment with Bf 140 nM was highly toxic, triggering death in 40% of the cells within one hour. This is expected since the accepted threshold for bilirubin toxicity approximately occurs at 70 nM . 63% reduction in cell viability at 4 h after bilirubin exposure were previously demonstrated in the rat neuroblastoma N-115 cell line . Furthermore, Silva RF et al. showed 85 nM Bf triggered deleterious effects on mitochondrial function. A full understanding of molecular mechanisms of cell death will require additional investigation. UCB has been previously proved to induce apoptosis in neuroblastoma cells, although necrosis could not be excluded . Furthermore, the criteria to distinguish sensitive from insensitive neuroblastoma cells remain unclear. One may speculate that subtle heterogeneity in the level of differentiation may play a role in susceptibility to insults. Alternatively, cell death induction may depend on cell cycle position. We then focused on the 60% of surviving cells to test the hypothesis that these neurons may express a homeostatic response. A gene expression approach was carried out to identify gene expression patterns and signalling pathways induced upon UCB treatment. No significant changes of gene expression were observed after 1 and 4 h of UCB treatment. After 24 h, 230 genes were induced while no down-regulated genes were observed even when an FDR of 20% was applied. The lack of an "early response" is surprising since it fails to provide a potential mechanism for cell survival within the first hour. Therefore, present data suggest that it is very unlikely that the molecular pathways induced at 24 hours play a role in the survival of cells after one hour of treatment. GO analysis of the "late response" genes proved for the first time that UCB treatment induces an ER stress response in neuroblastoma cells in vitro. Evidences for ER stress involvement are overwhelming. Among others, genes induced by UCB treatment include several molecular chaperones like BiP, a well-known marker of ER overload, as well as molecular components of the ERAD system, that has been recently positioned in a central stage among the molecular mechanisms of neurodegeneration [53, 54]. Furthermore, two well-known events in ER stress, such as XBP1 unconventional splicing and DDIT3/CHOP nuclear relocation, were proved to be triggered by UCB treatment, therefore providing additional experimental evidences. UCB also altered several components of the translational machinery including tRNA synthesis genes and translation initiation factors. The translation machinery is considered one of the major targets of the ER stress response to regulate protein synthesis and decrease protein overload. Since no data are available in literature about the relationship between UCB intracellular concentration and translation rate, there is a compelling need for an accurate proteomic analysis of UCB effects in SH-SY5Y neuroblastoma cells. A complementary cellular strategy in ER stress conditions includes an increase in protein degradation. In this context some UCB-induced genes suggested a role for autophagy. It is of notice that autophagy has been recently associated with neurodegenerative diseases as well as with inhibition of cell growth and entering into a quiescent state [55, 56]. This may correlate to previous reports showing a severe inhibition of cell proliferation mediated by UCB . Further experimental validation is needed to prove an increase of autophagy. Finally, the induction of both subunits of the transport system X(C)(-) was also observed: SLC3A2 (4F2hc) and SLC7A11 (xCT) are able to heterodimerize to mediate cystine-glutamate exchange and regulate intracellular glutathione levels. Since the maintenance of a high glutathione concentration may be protective , we speculate that induction of the X(C)(-) transport system may represent a major pro-survival response, as has been recently shown in neurons . Interestingly, we could not observe any significant differential gene expression of MRP1 at any point of the time course suggesting that this transporter plays a negligible role in UCB-induced adaptation in this in vitro model. In summary, the present study shows for the first time that intracellular accumulation of UCB in surviving neuroblastoma SH-SY5Y cell line provokes ER stress. UCB was purchased from Sigma (St. Louis, MO, USA) and purified as described by McDonagh and Assisi . UCB was dissolved in 0.6% v/v of DMSO and diluted in 100 μL of complete medium supplemented with 15% Fetal Bovine Serum containing 54 μM albumin. Bf concentration was 140 nM, measured as described previously . 3(4,5-dimethylthiazolyl-2)-2,5 diphenyl tetrazolium (MTT), HPLC-grade dimethyl sulfoxide (DMSO), and all other chemicals were purchased from Sigma, unless otherwise specified. SH-SY5Y human neuroblastoma cells (ATCC CRL-2266) were cultured in a humidified incubator at 37°C and 5% CO2 in F12-EMEM (1:1) containing 15% foetal bovine serum (FBS), 2 mM L-glutamine, 25 μg/mL gentamicin, 100 U/ml penicillin, and 100 μg/mL streptomycin at 37°C with 5% CO2. Cells were seeded at 6 × 106 cells in 75 cm2 flasks and grown for 24 h (cells reached 70-80% confluence). The medium was then replaced with experimental medium, which was either free medium (untreated samples) or 140 nM Bf medium (Bf 140 nM samples), or 0.6% DMSO medium (DMSO 0.6% samples) and cells were allowed to grow. After 1, 4 and 24 h cells were collected and processed for cell viability (MTT cell viability assay), microarray, quantitative RT-PCR and immunofluorescence analyses. Separate flasks of cells were used for each of the treatments and assays. Experiments were performed at least in three independent biological replicates at all time points. Cells were treated as described above and the MTT cell viability assay was performed as previously described by Denizot and Lang . Absorbance was measured at 562 nm using a microtiter plate reader (LC 400, Beckman Coulter, Milan, Italy). Cell viability of UCB treated samples was expressed as a percentage of the respective samples treated with DMSO alone. Total RNA was isolated using the TRIzol reagent (Invitrogen) following the manufacturer's instructions. Single strand cDNA was obtained from 1 μg of purified RNA using the iSCRIPT™ cDNA Synthesis Kit (Bio-Rad) according to manufacturer's instructions. Quantitative RT-PCR was performed using SYBR-Green PCR Master Mix (Applied Biosystem) and an iCycler IQ Real Time PCR System (Bio-Rad). Sequence of gene specific primers used for qRT-PCR is provided in Table 5. Expression of the gene of interest was normalized to house keeping genes (glyceraldehyde-3-phosphate dehydrogenase or GAPDH and β-actin) and the initial amount of the template of each sample was determined as relative expression versus one of the samples chosen as reference. The relative expression of each sample was calculated by the formula 2 exp-ΔΔCt (User Bulletin 2 of the ABI Prism 7700 Sequence Detection System). GAPDH and β-actin expressions are not modified under the present experimental conditions (data not shown). XBP1 splicing was studied using reverse transcriptase-polymerase chain reaction. cDNA was synthesized as herein reported. Human XBP1 primers (forward: 5'-AAACAGAGTAGCAGCTCAGACTGC-3'; reverse: 5'-TCCTTCTGGGTAGACCTCTGGG AG-3') were designed to generate cDNA products encompassing the IRE1 cleavage site as previously described . The unspliced (uXBP1) and spliced (sXBP1) mRNAs generate 473- and 447-bp cDNA products, respectively. The amplified products were separated on a 2% agarose gel and visualized with ethidium bromide staining. Total RNA was extracted as described above and purified using the RNeasy mini kit (Qiagen). The quality of total RNA was assessed using a bioanalyzer (Agilent 2100; Agilent Technologies) and RNA was quantified by using a ND-1000 Nanodrop spectrophotometer. Ten μg of each total RNA sample was labelled according to the standard one-cycle amplification and labelling protocol developed by Affymetrix (Santa Clara, CA). Labelled cRNA was hybridized on Affymetrix GeneChip Human U133A 2.0 Arrays containing over 14,500 transcripts. Hybridized GeneChips were stained, washed (GeneChip Fluidic Station 450) and scanned (GeneChip Scanner 3000 7G). Cell intensity values and probe detection calls were computed from the raw array data using the Affymetrix GeneChip Operating Software (GCOS). Further data processing was performed in the R computing environment http://www.r-project.org/, version R 2.5.0 for Windows) using packages from the BioConductor software project http://www.bioconductor.org/. Variance-stabilizing normalization was applied , using the "justvsn" function from the "vsn" library. Normalized data were then filtered based on the Affymetrix detection call, so that only probes that had a Present call in at least one of the arrays were retained . Data were then imported in the MultiExperiment Viewer (MeV) software  (version 4.0.01 for Windows XP), and statistical analysis was performed with the SAM (Significance Analysis of Microarrays) module [65, 66]. A False Discovery Rate (FDR) of about 10% (i.e. 9.317%) was applied to detect significantly differentially expressed genes. Microarray data have been deposited in the NCBI Gene Expression Omnibus (GEO) with Accession Number GSE16768. Differentially expressed genes were then specifically examined, based on their Gene Ontology annotation , for their cellular localization and for their involvement in some biological processes of interest. GO slim annotations were based on the Generic GO Term Mapper http://go.princeton.edu/cgi-bin/GOTermMapper using the Gene Association File goa_human_hgnc (Generic GO slim). For immunofluorescence experiments, SH-SY5Y cells were cultured on glass slides overnight, fixed in 4% paraformaldehyde for 10 minutes, washed with PBS two times, treated with 0.1 M glycine for 5 minutes in PBS and permeabilized with 0.1% Triton X-100 in PBS for additional 5 minutes. After washing with PBS and blocking with 0.2% BSA in PBS, cells were incubated with the anti-CHOP 1:100 (Santa Cruz Biotechnology) diluted in 0.2% BSA in PBS for 90 minutes at room temperature. After washing, cells were incubated with AlexaFluor 594 (Dako Cytomation)-labelled anti-mouse secondary antibody for 1 h. For nuclear staining, cells were incubated with 1 μg/mL DAPI for 5 minutes. Cells were washed and mounted with Vectashield mounting medium (Vector). Images were collected using a confocal microscope (LEICA TCS SP2). We thank Dr S Vilotti for kindly providing the immunofluorescence images and Dr M Biagioli for her invaluable qRT-PCR guidance. We would also like to thank Prof. G Tell for critically reading the manuscript and all members of Prof. G Tell, CT and SG laboratories for discussions. This work was supported by the Telethon Grant GGP05062, by the Regional Grant DL26 (Regione FVG, Italy) and by The Giovanni Armenise-Harvard Foundation career development award to SG. RC performed data analysis, assisted with the generation of microarray data, validated targets by qRT-PCR, wrote and revised the manuscript. CB and PG performed the cell culture and the MTT assays. PR performed the bioinformatic and statistical analysis of the microarray experiments. RF performed some qRT-PCR experiments. HK produced the microarray data at the CBM Genomics unit (Trieste, Italy). SG conceived, designed and wrote the paper. CT and SG provided support, direction and oversight of the experiments and revised the final manuscript. All authors read and approved the final version of the manuscript.